When it comes to delicious comfort food, there’s really not much we can think of that beats a good stroganoff – especially when all you need to cook it is a single skillet! One of our favorite parts about this dish is the addition of snow peas, which sneak in the refreshing crunch of a healthy veggie. (The kids even loved it!) This is truly one of the best stroganoff recipes we’ve found because it’s everything we love – fast, yummy and requires very little clean-up. On a night when you don’t want to spend too much time in the kitchen slaving over a meal, but you want to satiate your craving for a belly full of home cooked goodness, we’ve got your answer. This easy meal can be whipped up in under 30 minutes! How awesome is that?! Heat olive oil in a large skillet over medium high heat. Add mushrooms, onions and snow peas and sauté for 4-6 minutes, until tender. Transfer to a small bowl and set aside. In the same skillet, melt butter over medium-high heat. Add chicken and cook for 5-7 minutes, until no longer pink. To make a roux, whisk in flour then add half and half, chicken broth, Dijon mustard and worcestershire sauce. Continue to whisk until smooth. Bring to a simmer and cook 4-6 minutes, until sauce begins to thicken. Add mushrooms, onions and snow peas back into the pan and reduce heat to low. Stir in sour cream or plain Greek yogurt and add paprika, salt and pepper. 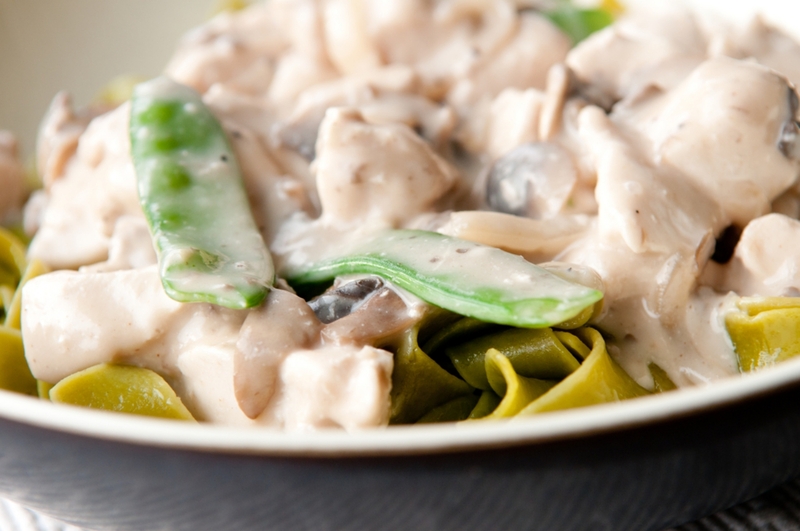 Serve over egg noodles or green ribbon pasta and enjoy!